A flourishing cycling social enterprise based in Southend-on-Sea has just celebrated its first birthday. 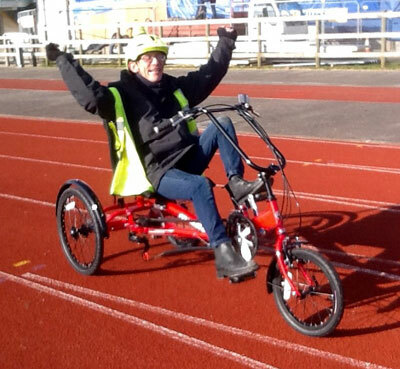 Based at Southend Leisure and Tennis Centre, Just Ride offers a safe traffic-free experience with specially adapted bikes and trikes, and regular two wheeled bikes, to cater for all disabilities or health conditions. Just Ride runs regular drop in cycling sessions for people of all ages and abilities. As part of the birthday celebrations, Just Ride staged a sponsored team event, with different cyclists riding a selection of Just Ride bikes round the track to see how many miles could be jointly covered. The funds raised will help support the work of Just Ride going forward. 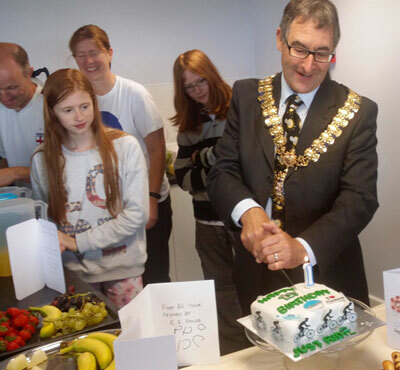 Councillor Andrew Moring, Mayor of Southend, joined more than 70 Just Ride fans and volunteers, to cut the birthday cake and tried out some of the Just Ride bikes. Councillor Martin Terry, Executive Councillor for Public Protection, Waste and Transport, said: “This has been an amazing year for Just Ride. With the help of its dedicated volunteers, it has gone from strength to strength and grown into the great club it is today. “The council is just one of a range of partners to support this excellent organisation which enables everyone to enjoy the fun, exhilaration and health benefits of cycling – whatever their abilities. Public Just Ride sessions are held every week at Southend Leisure and Tennis Centre, Garon Park, Eastern Avenue, Southend SS2 4FA, at the following times: Tuesday 10.00am to 1.00pm; Wednesday 10.00am to 12.00noon; and Saturday 10.00am to 1.00pm. Riders are asked to make a £2 donation. For more details please visit the Just Ride website, ring 07971 774479 or contact Just Ride by email. Click here for more information about cycle training opportunities and cycling venues in Essex, Southend-on-Sea and Thurrock.